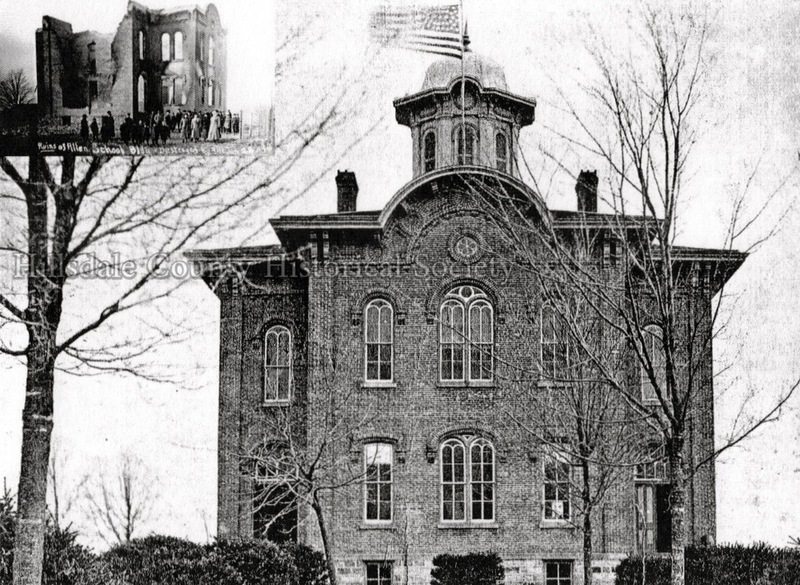 Allen High School was built in 1869 by Albert Prentiss, at a cost of $11,000. The school burned in 1913 (see inset). Within three weeks a resolution had been drawn to build a new school. This is the entire graduating class of 1904. This is the "new" Allen school house, c. 1920, with the Baptist Church at the left. In 1945 the district voted to merge with the Quincy Community Schools due to pressure from the state. Allen Station was a mile north of the village and included the depot, two small hotels and a saloon. A large business of buying and shipping grain was done here. An 1879 History of Hillsdale County states that, "aside from Hillsdale and Jonesville. Allen ranks among the most important villages in the county in the value and variety of her improvements." The brick stores "are a credit to the villages in the county in the value and variety of her improvements." The brick stores "are a credit to the village and testify to the taste and enterprise of her citizens."